Home: What is the Problem? In response to Hurricane Katrina in 2005, as well as the poor performance of the New Orleans’ public schools, the Louisiana State Legislature decided to remake the public school system in New Orleans (Aull, 2015). The legislature established the Recovery School District (RSD) and placed most of New Orleans’ public schools under its authority (today only 4 schools remain under the Orleans Parish School Board and all four are traditional public schools rather than charters) (Bruzguliz, 2015). The RSD then proceeded to turn all of the schools under its control into charter schools and fired 7,500 teachers, most of whom were black (Fischetti & Kirylo, 2014). These teachers were replaced by Teach for America recruits, most of whom were white and inexperienced. 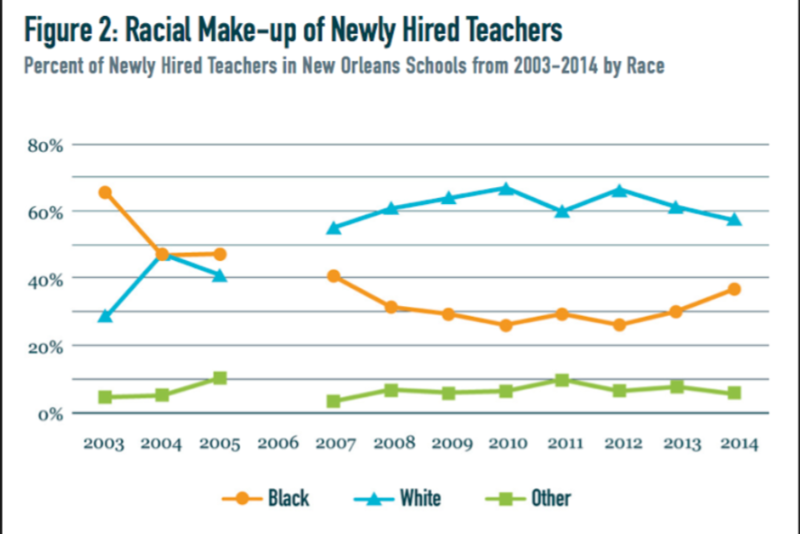 Thus, in New Orleans, the proliferation of charter schools has led directly to the decline of teachers of color in the city. Research has shown that both black teachers and black students are disadvantaged by the proliferation of charters. Further, research has shown that black students perform better when they have had black teachers in their schools. Both the proliferation of charter schools and the decline in black teachers, then, is an issue that needs to be resolved in New Orleans and nationally.